CALGARY, ALBERTA--(Marketwired - Jan. 28, 2015) - The Google (NASDAQ:GOOG) Maps team has just highlighted Blackline's (TSX VENTURE:BLN) ("Blackline") employee safety monitoring solution in the final chapter of its Maps are Going Google awareness campaign. Titled Monitor Assets, Anytime, Anywhere, this program presents how leading edge location-based technology empowers everyday business. Blackline's safety solutions monitor the health and wellbeing of an organization's most important asset-their employees. To view this latest phase of Google's asset monitoring campaign visit goo.gl/Zi1Aer. "Blackline is at the forefront of creating leading work-alone safety monitoring technology. 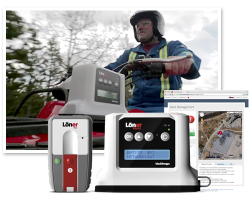 When seconds matter during a workplace incident, our Loner® safety solutions have the capability to make the difference by instantly notifying monitoring personnel," said Brendon Cook, Blackline's CTO. "Our customers have come to expect the best possible user experience from us. And delivering real-time situational awareness requires the best mapping interface where Google is the clear leader. Recognition by Google in their latest campaign underscores our position as a leader in the global safety monitoring industry." Blackline's Loner® family of employee safety monitoring solutions feature multiple technologies to improve the outcome of an employee who has suffered an injury, health event, or physical assault. Incorporating real-time communication and multiple location technologies, Blackline's Loner solutions help employers manage an efficient, pin-point emergency response to a worker's precise location. No matter where an employee is located-within buildings, in urban centers, or in the remote reaches of our planet, Blackline provides a complete suite of employee safety monitoring solution to match the challenge. For the complete Maps are Going Google story, visit seefurther.withgoogle.com. To learn more about Blackline's family of Loner employee safety monitoring solutions, visit www.blacklinesafety.com. To learn more about Blackline GPS, visit www.blacklinegps.com and follow Blackline on Twitter @blacklinegps.